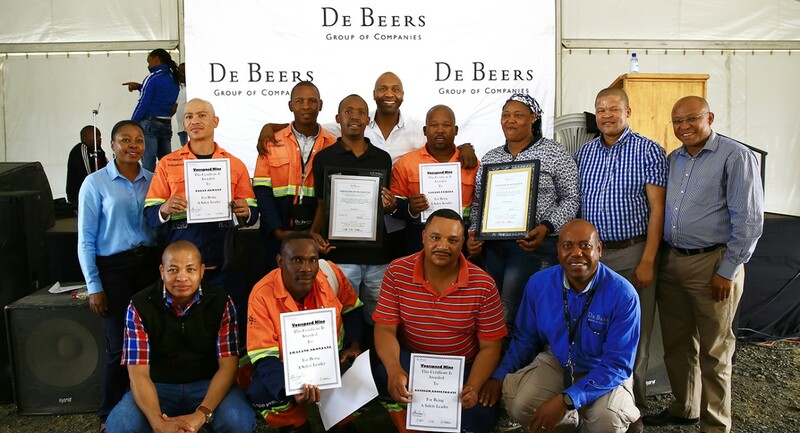 Safety for employees and the communities they come from was the theme for De Beers Group’s Global Safety Day. All round the Group, people held special sessions where the emphasis was on the need to be vigilant on safety – at work, on the way to and from work and at home. The company takes the view that safety does not stop at the mine gate but extends to its host communities. CEO Bruce Cleaver told employees in a video message: “The only production we care about is safe production.” He said no diamond was worth a human life. And Stephen Lussier, Executive Vice-President, De Beers Group Consumer and Brand, stressed at a safety session in London that “safety is not someone else’s job”. The company has now added a new ‘value’ to its current five values – put safety first. Safety was previously implicit in its values. But now it has explicit top billing in the suite of values (the other five are: be passionate, pull together, build trust, show we care, and shape the future). International footballer Lucas Radebe starred at Voorspoed mine in South Africa and told employees what staying safe and healthy meant to him. Lucas, who captained the South Africa team between 1992 and 2003, talked about the importance of teamwork and gave his personal story of overcoming career-threatening injuries. At Venetia mine in South Africa, employees were joined by David Sipunzi, General Secretary of the National Union of Mineworkers, and senior executives from the mine’s business partners. Highlights of the day included a performance by the Venetia Choir, the Venetia Industrial Theatre as well as a poem from Planning Clerk Carol Kekana. Zero harm to employees or mining communities is the main thrust of De Beers Group’s safety approach in all its operations – diamond exploration, production, sorting and sale. De Beers Group operations in Canada also joined in the activities on Global Safety Day (26 October). In Calgary, burn survivor and motivational safety speaker Spencer Beach encouraged people to think about the reasons why they work and why they want to return home from work safely. In Namibia, safety sessions were held at Namdeb, De Beers Group’s joint venture with the Government of the Republic of Namibia, and Namdeb senior figures took the safety message out and about. Namdeb Chief Operating Officer (now appointed CEO) Riaan Burger and Ludwig von Maltitz, De Beers Head of Special Projects, visited Southern Coastal Mines and Ludwig described employees’ commitment to safety as “tangible”.